Barbara Carlo is the Director of the Landside Operations Division for the Miami-Dade Aviation Department (MDAD). Ms. Carlo has been with the Aviation Department since 1986. She began her career in Landside Operations as a Landside Operations Specialist and was later promoted to Landside Officer 2. She was elected to the American Federation of State, County and Municipal Employees (AFSCME) Local 1542 and served as the Union’s Vice-President from October, 2006 to January, 2015. 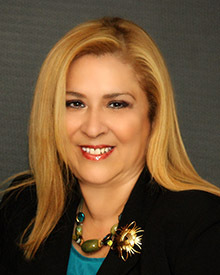 Ms. Carlo served 2 terms on the Executive Board of AFSCME State Council 79, from 2010 to 2014 and served as Chairperson of the AFL-CIO South Florida Transportation Coalition. As Division Director for Landside Operations, Ms. Carlo is responsible for ensuring the safe, daily operation of the airport’s landside areas, while upholding the public image of MIA to local residents, tourists and business travelers. She is tasked with the development and oversight of policies, procedures and activities for the landside areas of MIA. Landside Operations oversees transportation and employee parking contracts between Miami-Dade County and private companies; coordinates airport construction projects and related plans for traffic, safety and emergency operations; oversees the collection of airport user fees and enforcement of regulations pertaining to commercial transportation activity; and coordinates taxicab operations and enforces taxicab regulations at MIA. The division also participates with local, state and federal agencies, including government subcommittees, policy task forces, law enforcement agencies and local community groups, to formulate goals, establish policies and develop solutions to County-wide concerns that impact the daily operation of MIA. Ms. Carlo is a member of various professional associations, including the Society for Human Resource Management (SHRM) and Airports Council International (ACI), where she completed a certification in Terminal and Landside Operations Management. She is a graduate of the National Labor College and holds a Bachelor of Arts Degree in Labor Studies. She attended Villanova University, where she received a Certificate of Human Resource Management. Prior to joining MDAD, Ms. Carlo worked in the parking industry at Miami International Airport and at Newark Liberty International Airport.